Dumb Cane get its name from its poisonous sap that causes painful swelling of the mouth and throat, as well as vocal loss if eaten. Keep it away from pets who may play with or chew on this plant. It also can cause skin irritation, so I recommend wearing gloves while handling this plant. This attractive and popular house plant features a single, thick trunk that unwinds into several trunks as it matures. Its handsome, broad leaves are about 10 inches (25 cm) long and are splashed, streaked or speckled in green and white. Many varieties of Dumb Cane are available with varied leaf patterns. Choose one based on your own preference because they're all easy to grow. 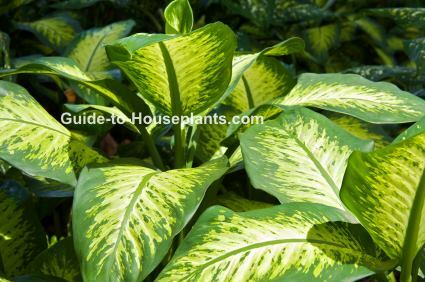 You'll find dieffenbachia for sale in nurseries or online year-round. 'Tropic Snow' is heavily marbled with creamy white and has green central veins. 'Camille' is compact reaching only 15 in (38 cm) tall and has green-yellow leaves edged in dark green with white central veins. 'Exotica' has leaves patterned with dark green and creamy yellow blotches with white central veins. 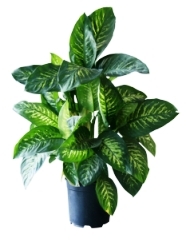 Pruning Tip: Cut back your dieffenbachia if it grows too tall. Use sharp pruners to cut off the top of the plant, leaving a few leaves. New growth will sprout from where it was cut. Any problems with Dumb Cane will show in its leaves. The older leaves may turn yellow and drop off. This is normal. If new leaves fall off, the plant is too cold. Keep it away from doorways or windows where could be exposed to cold drafts. Brown leaf tips are caused by sporadic watering. Water regularly, but don't allow the soil to get soggy. away any accumulated fertilizer. Wait a month before feeding again. If they are not getting enough light, leaves lose their variegation. Give the plant moderate to bright light, but not direct sun. Repot in spring or early summer when the plant has outgrown its pot. Always use a container with drainage holes to prevent soggy soil. 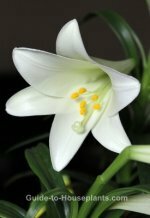 Although this plant is native to the South American rain forests, it tolerates average room humidity quite well and is easy to grow. Light: Bright light, no direct sun. Turn plant often to encourage even growth. Water: Water thoroughly and allow soil to dry out a bit between waterings. Drooping leaves on this plant indicates it's too dry. 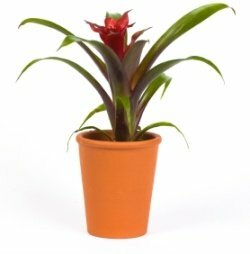 Water regularly with room-temperature water and use a pot with drainage holes so its roots are not sitting in water. Humidity: Try to maintain 40% relative humidity or higher. Indoor air can become extremely dry in winter. Take a look at these easy ways to increase humidity for your tropical houseplants. Soil: Soilless potting mix to allow good drainage. Fertilizer: Feed spring through summer every 2 weeks with a liquid fertilizer diluted by half. In fall and winter, feed monthly. Propagation: Take 3-5 inch (8-13 cm) stem tip cuttings in spring or early summer and insert in moist potting mix. Pups that emerge from the base of the plant can be cut away and planted in their own containers.